To coincide with Insuretech Connect, I've update the list of the world's top insurtechs with data for September 2017. As usual there is a methodological change to note. Since the last update in March, the discussion over whether or not privately-held price comparison websites should be classed as insurtech has continued. People at price comparison sites have reached out asking to be included; others have pointed out that insurance price-comparison is a long-established business model, meaning traffic isn't really an indicator of traction. So, for this update I've split the comparison sites out into a separate table. Meanwhile, we welcome new entries Jetty, CoverWallet and PolicyX. Several of the companies listed also operate in other geographic markets on different domains; for this analysis I focus on the highest-traffic domain only. The list of all the insurtech companies I've tracked is now too long to keep documenting, but as ever please tweet me if you know of insurtechs I might have missed. 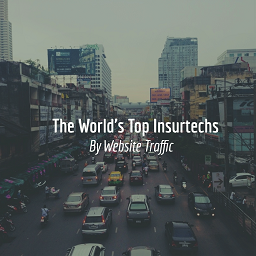 Here's the ranking of the world's highest-traffic insurtech companies, updated for March. This time I've extended the list from 20 to 25, and there are four new entries - comparison site Everquote, health insurance platform Health Sherpa, SME-focused Insureon (all from the US), and UK on-demand car insurance startup Cuvva. Thanks to CBInsights for the heads-up on the first two. Having thought further about what does and doesn't count as insurtech, I decided not to include companies like Namely & Justworks, as they self-identify as HR software, and as insurance broking is only part of their value proposition and business model. Finally, I've added an extra column to the table to show movement in ranking since last time. It looks like March was a good month for Zhong An and Insure The Box in particular. The list of other insurtech companies I've looked at is now too long to keep documenting (! ), but please tweet me if you know of insurtechs I might have missed. I had some great feedback on my original post on the world's top insurtechs, raising some interesting questions. Does insurance price comparison count as insurtech? Since online price comparison is a well-established model (Moneysupermarket was founded over 20 years ago), there is an argument that it isn't sufficiently innovative to be counted in the insurtech category. This meant I included Coverfox, The Zebra, PolicyGenius, Compara Online, and Coverhound, but excluded Policy Bazaar, Souqalmal, Compare It 4 Me, and Go Bear. Should app download volumes be included? For insurtech apps, downloads is likely to be a more representative metric than website traffic. However, I struggled to find a source of data for app download volumes that didn't involve signing up for paid SaaS subscriptions that wouldn't otherwise be relevant to my work! If you have this data and are happy to share it, I'd be delighted to review it next time I refresh the analysis (you can tweet me here). Anyway - here is the list based on November data, and expanded from 15 to 20 insurtechs. Many thanks to George Kesselman, Alyssa Connolly, Ian Jenkins, Dario Battista, Pierre Stanislas, and Andrea Collins for their helpful comments & feedback. Several of the companies listed also operate in other geographic markets on different domains. For example, Compara Online also operates in Brazil and Colombia; Simplesurance also operates in several other European countries. For this analysis I focused on the highest-traffic domain only. Insurtech is heating up. September brought the most eagerly-awaited product launch in insurtech history as Lemonade opened its doors. Last week, Gartner predicted that 80% of general insurers would either have acquired or partnered with an insurtech company by 2018. Commentary has mainly focused on funding round size and participation, together with subjective discussion of the disruptive potential of different business models - an approach exemplified by the recent Fintech 100, which contained 7 insurtechs. Much less attention has been paid to objective metrics showing the traction insurtech companies are getting with their customers. So what picture emerges when you look at website traffic? Update, 2nd November. Since I published this blog, I've had lots of helpful feedback about insurtech companies that I missed out of the analysis - either because I simply wasn't aware of them, or because I didn't perceive them as being in the insurtech category. I'll refresh the data at the end of November, and include these companies then. "Thank you I have insured four dogs for less than I was paying for two!!!! Great savings :)"
Is your Insurtech missing from these rankings? What other objective metrics would be useful to benchmark insurtech companies? Tweet & let me know. Lemonade: What's Not To Like?